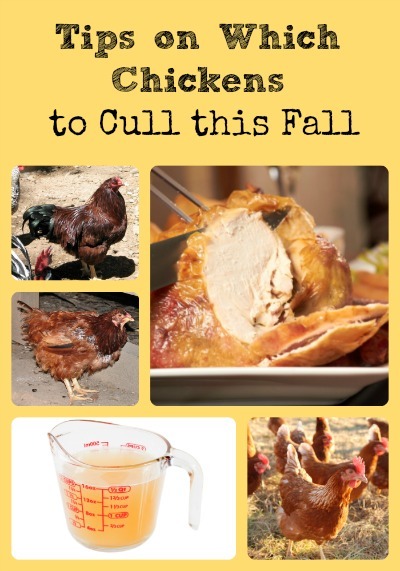 It’s hard to believe, but Fall is almost here again and it’s time to think about culling chickens to make room for the pullets that hatched in the spring. Fall is the traditional time for culling (reducing flock size) because we don’t want to support non-productive birds through the winter, and we can look forward to homegrown chicken dinners all winter long. The birds to consider culling are any excess roosters, unproductive hens, and slow molting hens. It’s sometimes difficult to contemplate culling and processing our chickens for the freezer or pantry; but it’s the economical thing to do on the homestead. And of course, if we’ve raised the birds and kept the flock, we know what went into the chicken meat we’ll be eating as opposed to factory farmed chicken from the grocery store. ole, then it’s a good idea to consider brining and/or slow roasting to produce a moist and tender bird (see Birds for Real Chicken Flavor for more on eating and cooking young roosters). Any hens that are no longer laying regularly are also traditionally culled in the fall, unless you’re willing to support (feed, water, and house) non-productive hens. Some form attachments to hens and are willing to support them through old age; however, the typical homestead approach is to cull these hens. Any bird older than a year is considered a stewing fowl, and that’s exactly how they should be cooked. Simply place the hen(s) (I usually do two at a time) in a large stewing pot, fill with water, bring to a boil, reduce to simmer, and cook until tender. 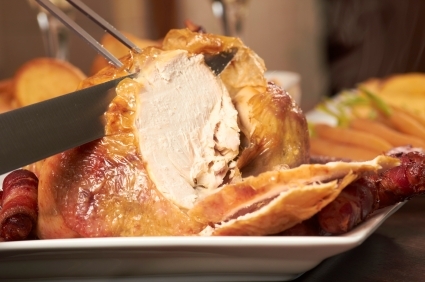 I like to start in the morning, and it’s generally 7 – 10 hours before the birds are tender. The meat should come off the bones easily, and it can be diced and used it for tasty soups. I find that by the time the stewing birds are tender, the meat no longer has much flavor, so I typically just use the broth for delicious chicken stock. Chickens molt in the fall, so it’s also the time of year when slow molting chickens can be identified and culled. During molting, chickens stop or significantly slow down egg production, and a chicken can take from 2 to 6 months to molt. A chicken that takes 6 months to molt is not as productive as a chicken that takes 2 months to molt (because it’s not producing eggs for 4 months more), so slow molting chickens are culled in the fall. You can tell how long a chicken has been molting, and how much longer she’ll continue molting by looking at her primary feathers (to learn how, see Fast or Slow Molting Chickens). 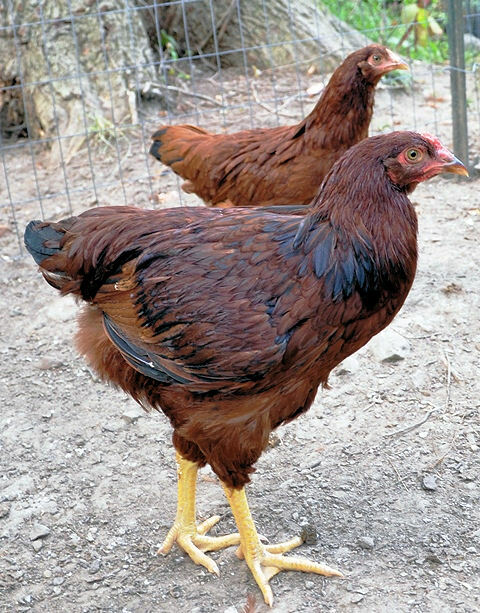 Slow molting hens are also considered stewing hens, and are prepared the same as above. I don’t look forward to culling the chickens in fall, but recognize that it needs to be done and I do enjoy having all those chickens in the freezer. It means lots of chicken broth for soup, and some great chicken dinners. It is a tough decision to make but as you said, most of us can’t afford to keep feeding and housing unproductive chickens. Otherwise you would surely end up with a very large flock! Mine have been molting for the last few weeks so no eggs at the moment 🙁 My rooster is also molting and he has been quite territorial about food, changing from allowing the girls to eat first to giving them a good peck on the head and chasing them away from it if they try to eat before he has finished. I’ve never had a rooster before (he was sold as a pullet). Is that normal with roosters that are molting or has he made himself the most obvious choice for culling? Hi Jana, you can tell a hen that is producing eggs versus one that’s not by looking at their combs and vents. A producing hen will have a bright red comb and a moist and supple vent. A non-producing hen will have a dull pink comb and a dry-looking vent area. If you think that one’s not producing but want to make sure before culling, put her in a separate coop or pen and see if she produces any eggs.